Purchase a KAL Limousine bus ticket and secure yourself a transfer to and from Incheon International Airport. The KAL Limousine bus offers 8 different routes covering most major areas in Seoul. Browse Korean Air’s SkyShop and pre-order duty-free items before boarding your flight. Email, phone or fax your order confirmation and only pay for your selection after you receive your items on board. As a member of the SkyTeam Alliance, this elite partnership gives passengers access to 1,062 destinations around the world, including access to world-class lounges. Korean Air is among the top 50 airlines in the world. Founded in 1962, it has upheld its sterling reputation as South Korea’s flag carrier. Passengers are treated with excellence and luxury services when they book Korean Air and it has become the choice airline for millions of customers. Korean Air is regarded as a major leading airline when it comes to inflight services, with a range of first-rate onboard meals and entertainment options. 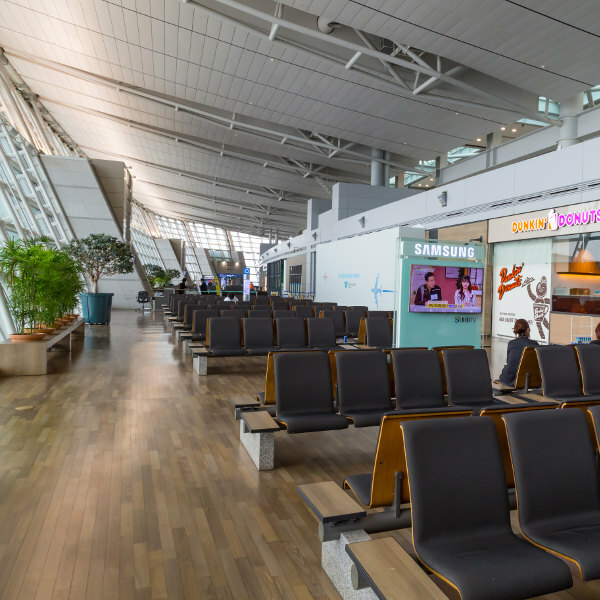 As a member of SkyTeam Alliance, Korean Air travellers have 110 airport lounges available at their disposal. Korean Air currently owns a fleet of 160 aircraft, operating flights to 43 countries worldwide. From humble beginnings to becoming a pioneer in air travel, Korean Air is no doubt, soaring to great heights. Book Korean Air flights to Singapore, Sydney, Taipei and other exciting places! Korean Air baggage restrictions are dependent on cabin class and destination. Infants travelling on international flights are allowed 1 piece of luggage up to 10kg, as well as 1 stroller and 1 bassinet. Children over 2 years of age are eligible to the same baggage allowance as an adult. Economy Class passengers are allowed no more than 12 kg on board. First and Business Class passengers are allowed to carry up to 2 carry-on bags not weighing more than 18 kg and exceeding 115 cm. Passengers with more luggage than the airline’s permitted allowance will be charged additional fees. You are not allowed to board Korean Airlines with items such as fireworks, flares, radioactive materials, explosives, flammable liquids, ammunitions, lighters and corrosive materials, box cutters, cutting objects, drills, saws and game darts. For international flights, check-in closes 60 minutes prior to departure time. For domestic flights, check-in closes 20 minutes prior to departure time. You may be required to present your visa, e-Ticket receipt and credit card used for online bookings. Passengers travelling on Korean Air flights with a valid e-Ticket can check in online. Check-in for domestic flights: 48 hours – 40 minutes before departure. Check-in for international flights: 48 hours – 1 hour before departure. Check-in for UK, USA & Canada flights: 24 hours – 1 hour before departure. This service is available to passengers not requiring an onward visa with a confirmed e-Ticket. For international flights, express check-in is available up to 60 minutes before flight departure. For domestic flights, express check-in is available up to 20 minutes before flight departure. Korean Air has five types of First Class cabins, four types of Business Class cabins and two types of Economy Class cabins. Depending on the aircraft, each of these seating options will guarantee you a wonderfully comfortable flying experience. Regardless of your cabin class, you can be sure of the highest service quality from departure to arrival. From interesting articles in their beyond inflight magazine, to movies, music and gaming programmes, you’ll never be bored on a Korean Air flight. Feel like royalty with luxury meal and wine services available to all passengers. Choose between traditional Korean cuisine or Western meals. Korean Air also caters to passengers with special dietary requirements and religious observances. Please order your meal 24 hours in advance to ensure the airline can accommodate your request. Korean Air has a route network that spans across 123 cities, including 13 cities within South Korea. 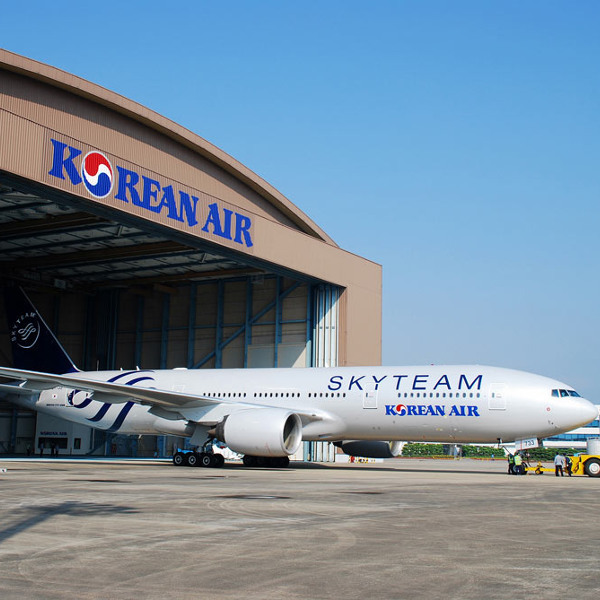 Korean Air enjoys a codeshare with a wealth of other airlines in the SkyTeam Alliance, spanning routes across 6 continents. Korean Air’s fleet operates 160 aircraft. • Boeing 737-800, Boeing 737-900, Boeing 737-900ER, Boeing 747-400, Boeing 747-8I, Boeing 777-200ER, Boeing 777-300, Boeing 777-300ER, Boeing 787-9 and Bombardier CS300.